Had so much fun making them! Haha, glad you like 'em! OMG LOVE THEM YOUR NAILS!!!!!!!!!!!!!!!!!!!!!!! Sooooo badass!! I love them! I couldn't resist such cuteness! ok these are just awesome! That looks really cool, Im pulling out my nail polish right now!!! OMG...did you do this by hand?!?!?!?! its amazing! 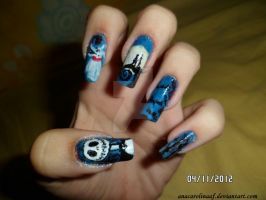 Love nightmare before christmas!!!! How long did this take? It looks awesome! Thanks so much! Roughly 10 min for the base (drying), about 20 for each design. I love theeeeese omg. I want to do it.